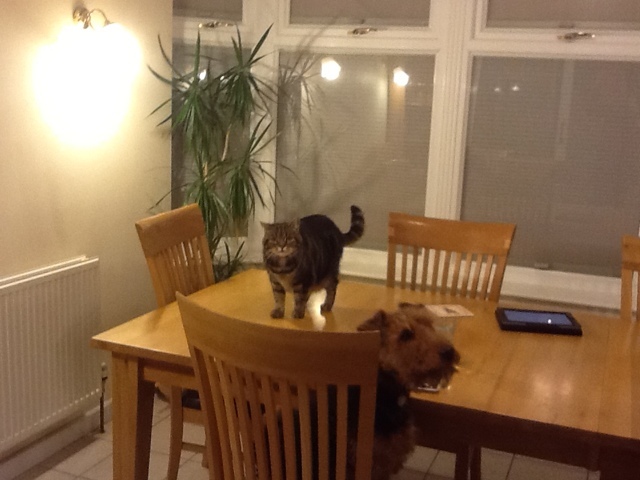 These partners in crime are Polly (on the table) and Merlin. I have been given kind permission to re-blog my friend Annalise’s photograph from her lovely Dogblog which features the much loved and naughty Merlin. Annalise says that she only just saved her dinner from them in time. As I told her, I was brought up on a strict diet of Tom & Jerry, which taught me that dogs and cats can never live together. Each time I see this dictum disproved, it seems like a little bit of magic.